ApparelMagic is a leading ERP purpose-built for fashion businesses. It has a multi-channel sales and inventory management capability that enables you to oversee information across multiple sales avenues. ApparelMagic also helps you supervise closely your product design, development, and costing. This way, you can ensure that you always have stocks of raw materials for in-demand items. On top of that, the solution assists you in improving your profit margins with better costing. What’s more, it automates the purchasing, manufacturing, and raw material management processes so you can focus on other business tasks. Furthermore, to help you with your global enterprise, ApparelMagic supports multi-currency accounting. With this, you no longer need to convert figures and risk numerical errors. With ApparelMagic, you can better boost your sales with a smart and real-time insight into your inventory. The solution applies this capability throughout your multiple sales channels, warehouses, and suppliers to centralize information. As such, you can be certain that you are offering items to customers that are still in stock. More than that, this aids you in making certain that you have healthy stocks of in-demand products. When you have plenty of items in demand, it is important that you have their raw materials on hand to keep producing them. That is why ApparelMagic has a raw material management module. It helps you view demand in real time and even automates the purchasing of additional supplies. On top of that, it tracks works in progress, pull sheets, and project cost actualization to streamline your workflow further. ApparelMagic can help you gain greater margins with its smart costing calculator. It takes into consideration supplier and shipping costs, labor expenses, taxes, and other financial factors. This way, you know how much to charge for your styles while making sure they are within reach of your target market. ApparelMagic provides you with a bill of materials designed specifically for fashion. From there, you can assign work processes, fabrics, styles, artworks, and other related materials. As a result, you can review items faster and with little to no errors. Your customers are everywhere on the web so it makes sense for you to have different sales channels, too. ApparelMagic makes it easier for you by letting you consolidate information from your different sales avenues in a single platform. One way to keep your customers happy is to fulfill and deliver their orders as promptly as possible. ApparelMagic assists you in that regard by giving you warehouse management and fulfillment tools. This makes your pick-and-pack, invoicing, and shipping processes efficient and accelerated. Accounting in different currencies is no longer an arduous task with ApparelMagic. The software lets you work in your currencies of choice whether you are buying, selling, or running reports. On top of that, the application helps you process credit cards online for smoother transactions. 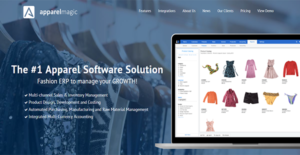 If you are interested in ApparelMagic it could also be beneficial to analyze other subcategories of Best Apparel Management Software listed in our database of B2B software reviews. Each company has its own characteristics, and may call for a specific Apparel Management Software solution that will be adjusted to their company size, type of customers and employees and even particular industry they cater to. It's not wise to count on locating an ideal solution that is going to be suitable for every business no matter what their history is. It may be a good idea to read a few ApparelMagic reviews first and even then you should pay attention to what the software is intended to do for your company and your employees. Do you need a simple and intuitive app with just basic features? Will you actually use the advanced tools needed by pros and large enterprises? Are there any specific features that are especially beneficial for the industry you operate in? If you ask yourself these questions it will be much easier to get a reliable service that will match your budget. How Much Does ApparelMagic Cost? ApparelMagic has three enterprise pricing plans that you can choose from. You can pay for your package monthly or annually, depending on your budget. We realize that when you make a decision to buy Apparel Management Software it’s important not only to see how experts evaluate it in their reviews, but also to find out if the real people and companies that buy it are actually satisfied with the product. That’s why we’ve created our behavior-based Customer Satisfaction Algorithm™ that gathers customer reviews, comments and ApparelMagic reviews across a wide range of social media sites. The data is then presented in an easy to digest form showing how many people had positive and negative experience with ApparelMagic. With that information at hand you should be equipped to make an informed buying decision that you won’t regret. What are ApparelMagic pricing details? What integrations are available for ApparelMagic? If you need more information about ApparelMagic or you simply have a question let us know what you need and we’ll forward your request directly to the vendor.